I’ve been quiet on my iPad observations. Fact is I’ve just been enjoying it. Perhaps so much that I’ve even overheated it. There is no question it is a powerful multi-media consumption device. I much prefer it for reading, over both my iPhone and my laptop. Something tactile and satisfying about scrolling and turning pages with the finger. So I thought I’d share my exploits using my iPad while camping off my BMW R1200GS. In fact the weekend after the launch the iPad was on my bike. I’d slipped it under the clear plastic map cover on my tank bag. I was very keen to test it out as a GPS alternative despite it’s lack of 3G and need for WiFi. Now one needs a hotspot if this is to be successful. So after working out that the iPad fits perfectly in the GS Tank bag I went after my hotspot solution. I’m tired of hacking my iPhone and so I pulled the SIM and stuck it in my trusty N95 with JoikuSpot installed. Turned on the Nokia and synced the iPad. Perfect…. now we have WiFi and iPad almost anywhere. 1. I can with an ungloved finger touch the iPad through the plastic and all touch features are retained. I did turn the screen up to the brightest setting. Lots of glare off the screen – yes it was on although can’t see that from above small picture. 2. I later added an iJet and remote. I stuck these in the bag too. 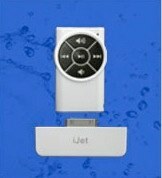 The iJet remote (which works via radio) can manage all the volume and track changes I want with a gloved hand. 3. I locked the iPad screen and added a plug for the earphones so it would be accessible. Hooked up to my Shure earphones and I had a great experience. No wind noise and a low level of music. Better than earplugs. 4. The maps are incredible and there is enough memory in the system so google maps seem to go small and large and can be pushed around at any time regardless of whether there is a connection. If you have a travel bug just planning your trip on the iPad looking at maps is sort of cool. The downside. Google Maps doesn’t yet allow those advanced features that let you drag the route or specify no highways in the App. 5. It revolutionizes the entertainment available in a tiny tent. I hung it from the roof and watched movies. Lots of battery life. However, forget downloading from iTunes while on the move. 6. In the morning it charged relatively quickly off my new 2 amp Kensington USB charger that plugged into my standard power socket on the bike as we went up the road. 7. While N95’s running as wifi hotspots are powerhungry it was easy to keep the charge off the USB. I also ran my iPhone in Wifi mode no SIM off the same hotspot on a couple of occasions. a. Sun! The screen isn’t really effective in bright sun. I never really expected to read it while riding and I seldom ride at night. There’s enough going on already on a bike. And no, movies on the road weren’t on the agenda either. In future I’ll keep it in the normal folio case I have for it on top inside the tank bag. The lid is useful as a shade when stopped and viewing the map. b.Overheated: I’m not sure why but this last weekend under the plastic I got a total overheat and the iPad shut down. At that point I put it back in the tank bag. It cooled off and back to working. I don’t think it took well to the direct sunlight above even though I wasn’t using it. Black screen – music playing. c. No GPS: The lack of real GPS never worried me. I can read a map. I wouldn’t buy the 3G to get that higher level of accuracy right now although I can see it would be preferred. The benefit comes when finding your position on the map when AT&T is nowhere to be found. d. AT&T Coverage: Until you have really spent time out on the backroads of California you have no idea how sparse AT&T connections are and how frequently there is no data at all. The more backroads I travel the more off the grid I know I am. I’m sure the iPad is going to generate some really interesting GPS / Mapping solutions. The Garmin / TomTom killer mark two. That may get me to trade up.Right now I don’t know of any programs that have been launched. A and B above wouldn’t really be an issue in a car. Note: Important note! If I’m carrying my stuff places I’d rather take my iPad than my iPhone. Taking my Macbook camping is more of a hassle and it has no battery life relatively. It also takes up way too much room although fits nicely in the lid of a side case. The iPad obsoletes the need re updates, staying in touch etc. It would help if the iPhone would tether without a jailbreak (again). I’m almost at the point where I’d never take anything but the iPad to any conference, on vacation (perfect for that) etc. I’ve never understood why “integrating” GPS and navigation systems into cars is such a smart thing. I’ve not had a new car in years and I’d never purchase one with Navigation installed. The iPad could make for an awesome in-car system (yes it was done on the first weekend). By contrast I understand more why Bikes have expensive Garmin units mounted. Once you go in search of getting lost it is rather nice to have. Yet a waterproof unit with the latest bluetooth etc can cost you close to $1000 with mounts. So you will have to understand that I’m happier with my iPad substitute. It also saves me a fortune in buying maps and adding “camping” to the google maps search can even find you a spot to stop for the night. Maybe there is some special mount and visor coming that will make integrating the iPad simple and effective. That’s a farkle I may want to try out. Great review! 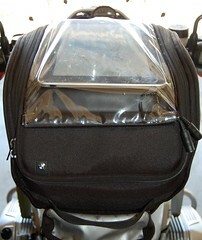 I own a K1100LT and a tank bag and have been wondering about adding an iPad. I also motorcycle camp, so your review hit me where I live. I’ve been using my iPhone for these things, but the screen is too small to use while actually riding. Thanks for the comment. Yes I too have been fishing my iPhone out of my pocket and pulling my glove off when necessary. Big problem is… the brower doesn’t have the same memory capability so doesn’t store the map the same way the iPad does. So even when no coverage I still seem to have access to view the “search” google maps. I may sell mine and still get a GPS one. However, leaving it in the sun or hoping to view it while riding is not going to happen in the facing up position. Don’t think there’s room to mount it behind the AeroFlow screen. Enjoy the ride and camping! Have you tried any of the dedicated Navigation apps like CoPilot Live? I, too, started out using an iPhone mounted on my tank via suction cup (only in good weather), but would like to give the iPad a try in a setup like yours. and sewed a 1/4″ spot in the index finger of my right glove a la Instructables. Works well. Good write-up btw. I’m loving my iPad (I went with the 3G specifically for GPS). There are a few apps out there that allow map downloading–topos and street. I’ve used Navigon in Oregon with success. I never knew you rode motorcycles. Damn, we coulda planned to meet in some exotic locale like Sudan or Syria! Good write up. I still don’t have an iPad, but will break down one day soon. Think your blog was my inspiration! Had the GS now for a year and going further and further all the time. The iPad beats a netbook or mac on the bike anyday. Sudan’s not yet on my agenda but I’m on for something closer to home! I’m not sure it’ll happen, but slight chance that I’ll take a couple weeks and head to Alaska end of July or early Aug. Another friend just bought a GS, he lives near Eureka, CA. So I gotta get out and up there. You’re still in Pac NorWest, right? If it happens, it could be fun. Alternatively, I’ll be speaking this winter at a few dealers in the area; if the weather’s right, I’ll ride. Where do you service your GS? Check out the ‘PaddiCaddi” on ebay. Search “iPad bicycle mount”. I found one on Craigslist and it passed all my expectations. I paid only $49 and it is worth every penny. for anyone wanting to use their ipad/iphone for navigation, but upset about service cutouts in bad reception areas, try the bad elf gps receiver. 100.00 and you are ready to go. Fritz, I took a look at this device. I’m a little confused re the benefits or the value for money. This seems like an expensive upgrade to a WiFi only iPad. Also unless there is a cache for the maps i.e. they are on the device GPS won’t help that much. For iPhones the GPS is built in. GPS continues to work even if there is no connectivity. Eg Motion-X will record your track even if you cannot get the map. GPS does not solve a lack of connectivity relative to downloading maps. This item may have been useful when I had an iPhone 2G or with the right maps program for an iPod touch. Then today I’d consider selling it at $20 or $25 with a free downloadable map program. That would turn an iPod Touch into a decent car system. I generally think things have moved on. It’s all about having maps local. My iPhone will track via GPS, as stuart notes regardless of connectivity, my route and I can with an app I can take that track file and sync to photos with aperture for geo tagging. but without local maps any GPS receiver is useless for navigation. Stuart, I agree with you re: the Bad Elf GPS. Great for an iPod Touch or a non-3G iPad, but you still have to buy dedicated GPS software if you plan to go outside of 3G coverage areas. For the last year or so, I ride with my iPhone suction-cup mounted to my tank running Navigon and I tuck my iPad 2 into my coat for route planning over lunch at the roadside cafe. As an aside, Navigon now lets you choose which US State maps you want to carry on your device, and they don’t charge extra for an iPad version. I should buy stock in Navigon.